Prolight Concepts Group have taken exclusive UK distribution of Kuzar Systems, a Spanish company located in Valencia, dedicated to the design, manufacture and distribution of lifters and lifting accessories for the lighting and sound industry. 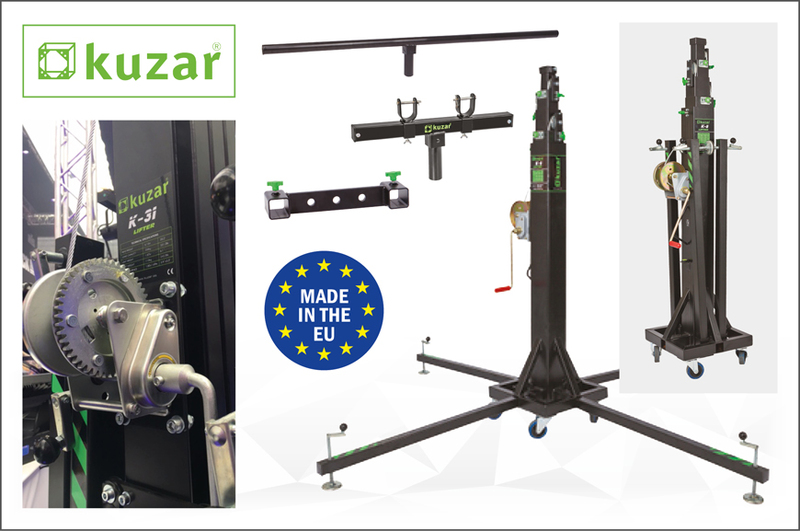 Designed for the professional user in the event and rental industry, Kuzar lifters are manufactured in Europe to both BGV C1 and CE (2006/42/CE) standards, and are also backed by a two-year warranty. The lifters feature ‘KAT’ locks that offer two positions, one for raising the lifter and the second for locking the lifter while static at height for increased safety. Each lifter features high quality, AL-KO winches loaded with steel cable and are available in either telescopic vertical lift for truss and lighting fixtures or front-loading for lifting truss and compact line array systems. When not in use the lifters pack down so they can be stored in a compact space and the majority feature casters making transportation easy. The accessories available make the lifters suitable for an even wider range of applications.